What Goes Into a Catalog Cover Shoot? Customers often ask us how we go about coordinating our catalog cover shoots. Most of the time we shoot locally, either at our studio or at a nearby location. eStudios, our catalog designer and studio, is right around the corner from our headqaurters so we like bringing in unique vehicles in a controlled setting. During the warmer months, we'll go out to a local customer's house, if he or she happens to have a cool garage to shoot at or in front. 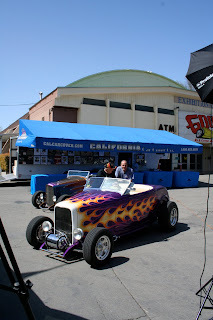 At the Grand National Roadster show this year, we spoke to longtime customers and friends, Steve Moal and Roy Brizio. 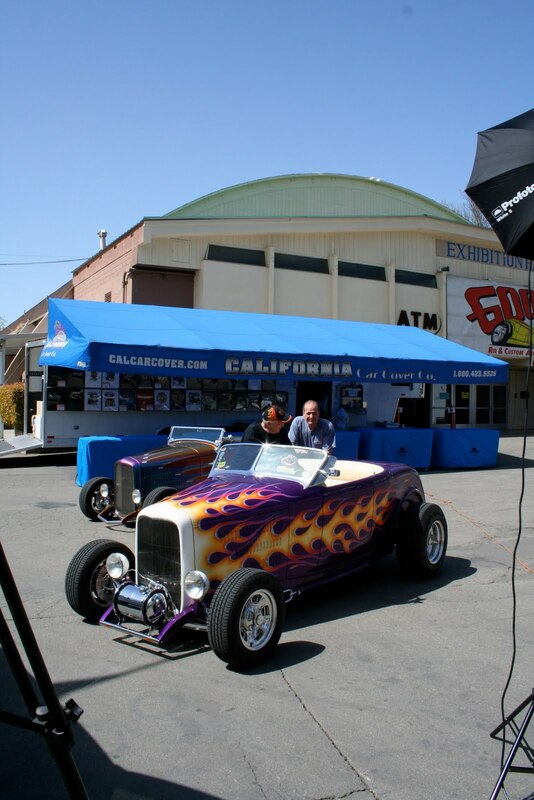 Steve and his son, Michael, had just finished a unique roadster that was on display at the show, and our owner, Jim DeFrank, wanted it shot for the catalog cover. Roy, and his father, Andy have been friends with Jim for many years and Jim wanted them to participate in our annual Father's Day catalog cover. Both customers work in the Bay Area so we had to do something different this year. Jeff, from eStudios, and I, traveled up to the Bay Area to shoot both cover shoots in one day. It was the first time that we had done two cover shoots in one day, plus done cover shoots that far from home. It was a little stressful, but we think well worth the effort. After taking the first flight out of Los Angeles, we arrived at Moal Coachbuilders in Oakland, Ca. The Moal family has been in the fabrication business for generations and we were thrilled to see the unique shop. After a quick tour of the facility we began setting up the shot. 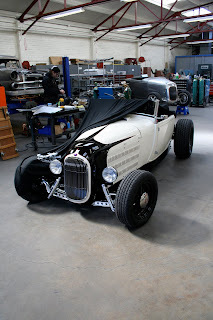 We took a lot of great photos of Michael's roadster, many more of which can be seen on our Flickr page. 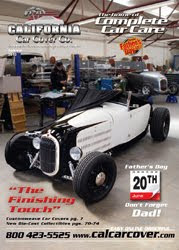 To get the cover shot just right, we enlisted the help of some of the workers at Moal Coachbuilders. We are thankful for their assistance in making the cover look great. We finished up in Oakland around noon, so after a quick lunch, we drove over to Pleasanton, Ca to meet the Brizios at the local county fairgrounds. There was a Goodguys car show going on that weekend, which a crew from California Car Cover was attending. Roy and Andy agreed to meet us there, so we were grateful for their cooperation. Once the vehicles were in place, we just had to wait for the sun to cooperate. It was a very sunny day, but the shoot when just as planned. 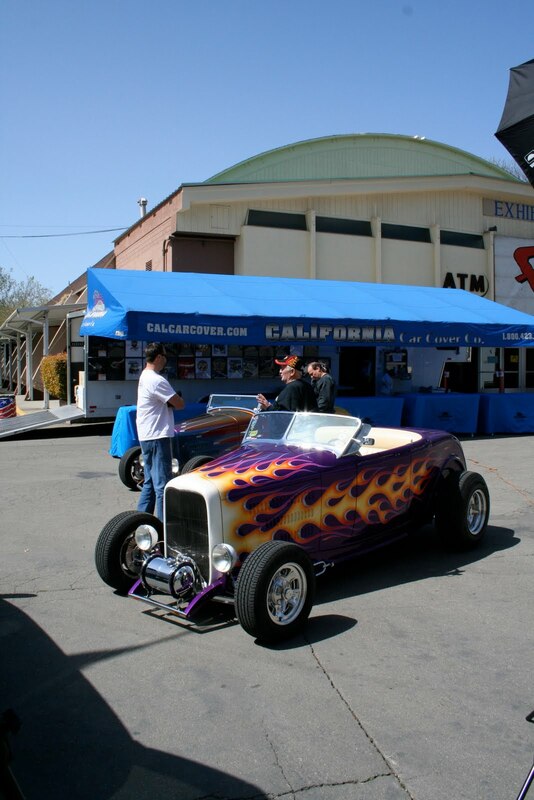 Those roadsters sure do look good in front of our trade show set up. In case you have not received your latest catalog from California Car Cover in the mail yet, here are the finished products. 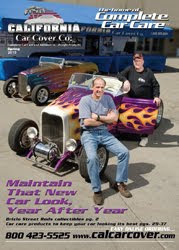 June 2010 Cover: Featuring Roy and Andy Brizio with their roadsters.